Two residential towers, dense with trees, will have their official opening later this year in downtown Milan, Italy, near the Porta Garibaldi railroad station. (The image is not a photograph, but an architect’s rendering. The towers are built and the trees are going in right now.) I love this. I think these towers are gorgeous. Milan is a very polluted town; these trees will cleanse the air, pumping out oxygen and greening the cityscape. I think cities one day could look like mountain vistas; I’m enthralled. But I am not Tim De Chant, tree lover, blogger, critic, who says this won’t work. All these trees, he thinks, are about to be dead. He recently posted an essay on his Per Square Mile blog, aimed at architects. He called it, “Can we please stop drawing trees on top of skyscrapers?” He thinks builders know squat about trees. I hope he’s wrong. I know I seem like Buzz Killington to a lot of architects—and non-architects, Krulwich included—but that wasn’t my point…entirely. To me, trees atop buildings have become an architectural crutch, a way to make your building feel sustainable without necessarily being so. And that’s a charitable assessment. Here’s how I really feel—trees on skyscrapers are a distraction from rampant development and deforestation. They’re trees for the rich and no one else. They’re the soma in architecture’s brave new world of “sustainable” development. In reality, trees on skyscrapers will likely be anything but sustainable. Structures built to support trees need to be over-engineered compared with their abiotic equivalents—trees are heavy, so is dirt (multiply so when wet), and so are watering systems required to keep them alive. If those trees are to have a chance on these windy precipices, their planters had better be deep, which further compounds problems raised in the previous sentence. A skyscraper that’s built to support trees will require more concrete, more steel, more of anything structural. That’s a lot of carbon, not to mention other resources, spent simply hoisting vegetation dozens of stories up, probably more than will ever be recouped in the trees’ lifetimes. Bosco Verticale, the oft, and often only, cited example of a tower to be built with trees on top, is expected to cost $85 million. Stefano Boeri, the architect, estimates adding trees to the design pushed up construction costs about 5 percent. (No word on maintenance costs.) Whether that’s true or not, we’ll have to take his word for it. If we do, that means they will spend $4.25 million to put 2.5 acres—one hectare—of forest onto the side of a building. Now, let’s say we take that money and resuscitate the region’s natural habitat.¹ Average costs run about $500 per acre for reforestation in U.S. national forests, with a top end of about $2,000 per acre. Let’s assume the worst. That means that with $4.25 million, you could restore 2,125 acres, or about 860 hectares, of forest. That’s 860 times more forest than is plastered on the side of Bosco Verticale. At the least. If restoration costs come in at the low end, about $200 per acre, it could be as high as 8,600 times more. Then there’s the ecological value of each. Bosco Verticale will be home to a few birds (most of which will live in the city regardless) and some invertebrates, but not much else. It’ll also require massive human inputs—water, fertilizer, tending, and replacement. I covered the first of those three in my previous essay, so I’ll just elaborate on the last point here, replacement. Let’s say trees on a skyscraper will live for an average of 20 years—a generous assumption given that more than 50 percent of street trees, which are exposed to more benign conditions, die after just 10 years—what will we have gained? A skyscraper that needs an overhaul every 20 years. A real forest, on the other hand, can replace itself. It can also support hundreds, even thousands of species, even in the middle of the city. A survey of the 315-hectare Central Park, for example, found over 800 species. Near Milan, at Parco Regionale di Montevecchia e della Valle del Curone, there nearly on it’s 2,350 hectares. Biodiversity is just one measure. These forests also purify water, maintain nutrient cycles, and don’t require much in the way of maintenance (if any). Here’s an alternate plan: Instead of planting trees on buildings, let’s focus on preserving and restoring places that already have, or desperately need, trees. Boeri and I agree on the importance of the latter. Bosco Verticale is the first stage of Boeri’s larger plan, one that includes preservation and restoration of existing land.² Bravo. It’s clear that Boeri understands the big picture, that to make a truly sustainable city, you have to incorporate ecosystem function on a broad scale. We still disagree on the value of trees on skyscrapers: he, and Krulwich, see them as an inspiration; I see them as a distraction and potential liability—what if the Bosco Verticale becomes a brown eyesore, turning people off to his larger vision? 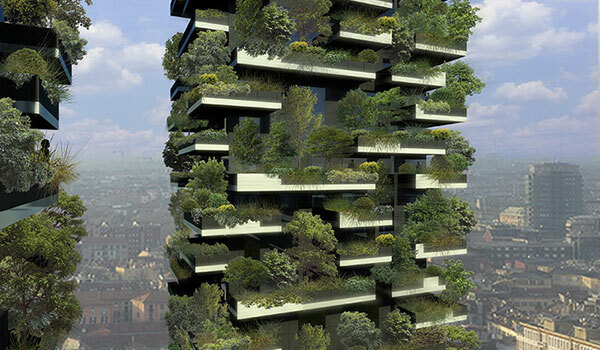 I’d love it if Bosco Verticale and other proposed arboreal skyscrapers were sustainable and successful.³ Who wouldn’t want to live in a city full of tree towers? But I just can’t make a case for it. Plant physiology tells me that the trees, if they do survive, will require constant and costly maintenance throughout their short, brutal lives. Finance tells me that the money required to afforest a building would be more effectively used for restoration and preservation. And my gut tells me there are more equitable ways to give people trees, not just to those who can afford it. Roman, Lara. 2006. Trends in street tree survival, Philadelphia, PA. Master’s thesis. Gorte, Ross W. 2009. U.S. Tree Planting for Carbon Sequestration. Congressional Research Service R40562.